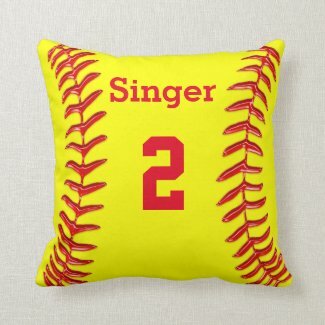 Really Cute and PERSONALIZED Softball Pillows for Girls with HER NAME and Jersey NUMBER typed into the template text boxes. 100% Guaranteed with fewer than 1% of products returned to Zazzle. Some of the softball pillows can be personalized on the FRONT and BACK. Fun and cool Softball Room Decorating Ideas for her. 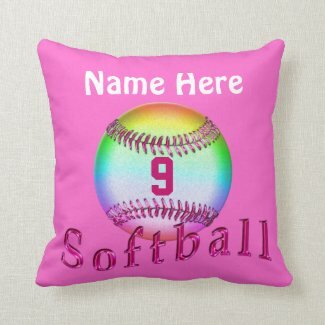 CALL me, Little Linda Pinda if you would like me to HELP you customize your softball pillow or create a different softball pillow: Linda: 239-949-9090. 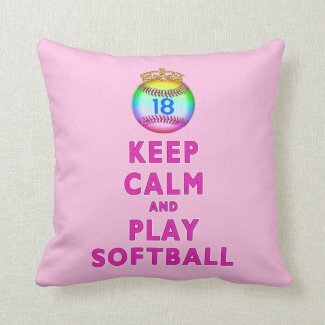 Super nice gifts for Softball Players and Gift Ideas for Girls Softball Team. What a great memory of her days playing ball. Celebrate the end of the season, birthdays or nice Softball Christmas gifts. 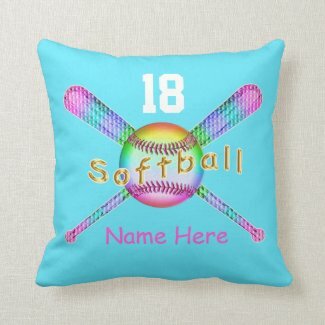 She will absolutely love the pretty and unique Softball Pillows because they have her very own Name and her sports Number on it. Cool multicolored rainbow metallic looking Softball and glassy like word “Softball waving across the ball. Be sure to look at the back of these pillows by clicking on the image or the link. “100% LOVE IT” Guarantee with an impressive Less than 1% Return Rate plus Zazzle earned an A+ BBB Rating. Type in Her Jersey NUMBER , NAME or Monogram into the Text Box beneath the “Personalize it” section which is located to your right once you are on the product page. You can change the background color on many of the Softball decor too. See the INSTRUCTIONS by Clicking on the Read More” of the Product description area. Be sure to look at the cool back of the pillow too. with Her NAME, Jersey Number and Softball Scrolled across. Our designs are like no other. Look closely at the glassy like Softball Threadings and Softball word. When you are on the Softball Pillows page, to your left you will see a symbol that resembles an “X”. Click on that to view the pillow up close. You will need to look past the Zazzle “Z” watermark. You probably have seen the super popular and famous “Keep Calm and Carry On” stuff. Here is her version of the famous British Poster. The Multi-Colored Softball even has a Gold Keep Calm type crown. 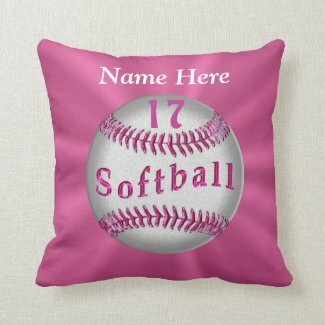 Softball Pillows are not only wonderful Softball Decor but great Softball Gifts for Girls. They will absolutely LOVE the cool Softball with their Jersey Number and their Name on top. The glassy like word Softball scrolled across the pillow is also very cool. Original Design by Little Linda Pinda Designs.